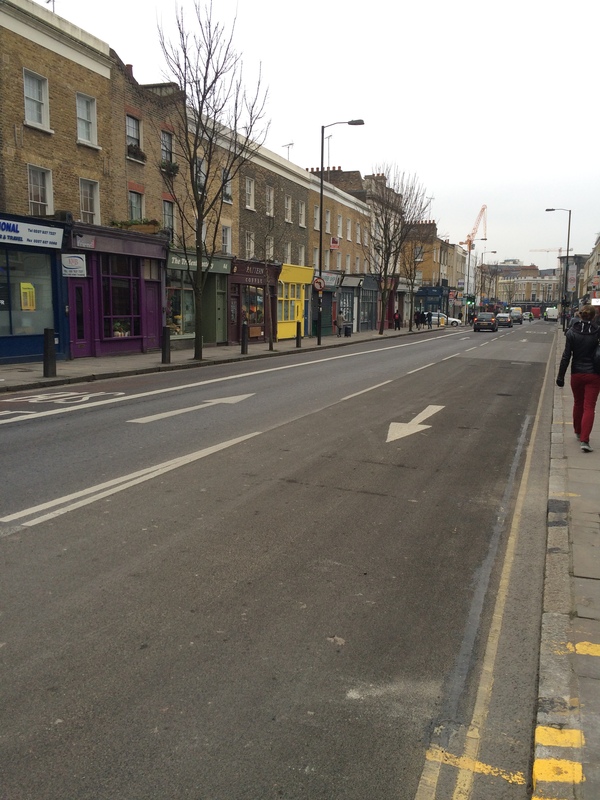 ← Cally Road single yellow lines removal – does anyone know what is going on? The return of the Cally Road to two way working has changed the traffic flows in Kings Cross at a time when they were changing anyway due to new development. The new Cally two-way was designed to be part of longer term changes to get rid of the lethal 1970s gyratory that blights the area. I lived on Wharfdale Road and the Cally in the gyratory for about three years all told and the traffic made it unpleasant. So the changes it should only be seen as part of a whole, including for instance the huge improvement to Wharfdale with traffic calming ‘nibs’ and reduction in lanes and speeds. The new Caledonian Road two-way traffic scheme is being monitored by the Council and will be fine-tuned to make sure any adverse impacts are dealt with. This will include the phasing of traffic lights and dealing with the risk of “rat-running” in any adjacent streets. Please let me re-assure you that this scheme does not change the total number of vehicles using Wharfdale Road or Caledonian Road or the side streets. Forgive me is I repeat text int his reply which replicates things I may have said to some of those copied-in to this email. Firstly, returning Caledonian Road’s one-way traffic system to two-way traffic is the initial stage of an ambitious plan to completely remove the gyratory system around Kings Cross. There is an increasingly realistic prospect that Transport for London, which is responsible for most of the major roads in the gyratory, will come forward with options to make this happen. The main reason to return roads around Kings Cross to conventional two-way traffic movement is to change the balance between vehicles, pedestrians and cyclists. In short, we want pedestrians to become the main users of the area around Europe’s largest public transport interchange. The south end of Caledonian Road is now busy with pedestrians in volumes that no-one could imagine 10 or 15 years ago and it’s important that we reconfigure the highway so that it is less engineered for the benefit of vehicles that are driving through the neighbourhood coming from somewhere else and going to somewhere else. The scheme has also allowed Islington Council to redesign the junction at Killick Street so that Wharfdale Road cycle users can now cross over to Killick Street (South) and towards Pentonville Road. This fits in to a plan which is shared with Camden to help cyclists bypass the worst of the Kings Cross intersection with its inherent dangers for cyclists. We recognise that more work is needed, for example, installing directional signs from York Way into Caledonian Street and then left into Caledonian Road. This has to be done with Camden because it is the highway authority for York Way. Cyclist in particular have asked for better signing because it is a very much safer route for cyclists going from Kings Cross northwards. Because the new route is not widely known to users such as black cab drivers, the Council has asked the taxi trade (via LTDA) to publicise the changes to the road layout to encourage more black cabs to use the northbound lane. Some additional time will also be required whilst the street layout changes are incorporated into updated releases of GPS software. The phasing of the lights at the Killick Street junction is now different to the previous signals and this is mainly to allow greater priority for pedestrians and cycles. The Council is monitoring the vehicle movements in order to adjust the signals phasing so that southbound traffic queuing at these lights returns to previous patterns. Some vehicles are now rat-running from Wharfdale Road to All Saints Street to avoid the lights at the Killick Street junction and measures will be undertaken to reduce or stop this. The Council is already consulting on changes to parking rules which will restrict parking on the northbound lane because traffic is being hindered by parked vehicles. Keeping the prohibited right turn from Goods Way south into York Way. This was originally introduced to prevent construction traffic using Wharfdale Road and over the past 3 years Caledonian Ward Councillors have insisted that Camden retains this restriction. The Goods Way/York Way junction is about to be rebuilt to provide 3 light controlled pedestrian crossings in place of the current single crossing. As part of that rebuild, the right hand turn prohibition (except cycles) will become permanent. This is one of the most important factors that protects Wharfdale Road from significantly greater vehicle volumes. Traffic movements around the wider area have changed immensely in the past 2 years but particularly in the most recent 4 to 6 months. Now that Goods Way is no longer impeded, the volume of vehicles using Goods Way in both directions has massively increased. As you will recall there was a long period when it was completely closed and traffic volumes throughout the area reduced as a result. It has now become very actively used by traffic servicing the stations, the new N1C development and for traffic bypassing the whole Kings Cross area. One particular impact which is very illustrative has been the massive increase in traffic using Copenhagen Street. Many mornings at 9am traffic is queued the entire stretch between York Way and Caledonian Road. On Copenhagen Street are 2 primary schools and a nursery / children’s centre and one of the hardest working school crossing (“lollipop”) officers I have ever met. That scale of change has all happened in the course of a few recent months as the ecology of traffic movement around Kings Cross has evolved in ways that were relatively unpredictable. For this reason, we are shortly to meet with Camden to discuss how S106 money (payments made to Camden by Argent, the N1C developers) will now be used to mitigate the effects of their development. In addition, we have secured further s106 money to improve highways around the hotel development at 60 York Way and I expect some of this will go to reduce traffic impacts on Wharfdale Road. I am hopeful that we can adjust the Caledonian Road scheme so that it achieves the intention to calm the traffic on Caledonian Road, give priority to pedestrians and cyclists and mitigate or remove adverse impacts which have emerged. One point not addressed here is the fiasco of the Institute of Physics at Balfe Street, that was permitted recently – this will attract 800 people a day to this part of the Cally and so far we see no plans to use S106 money from that to offset the local impact of this many visitors, their taxis and bicycles. This entry was posted in Bad Gyrations KX Campaign, New and tagged Caledonian Road, cally road, gyratory system, TfL, Wharfdale Road, York Way. Bookmark the permalink. It’s not clear (to me, anyway) whether you are claiming that there already is a ‘huge improvement to Wharfdale Road’ (as a result of returning the Cally to two-way traffic), or whether the ‘huge improvement’ is anticipated – as a result of further changes in the future. If the former, then you couldn’t be more wrong – see my comment on the previous post. If the latter, how long do I and other residents of Wharfdale Road have to wait for these (anticipated) improvements? (b) we will also be putting a double white line demarcating the southbound and northbound lane to bar vehicles from veering across into the southbound lane (technically the lines indicate an overtaking prohibition). I should also assure Lynne there will be further improvement works to Wharfdale Road, firstly because the York Way junction is going to be redesigned; and secondly because there is a source of funding to help mitigate traffic on Wharfdale and make it safer for pedestrians and cycles and there will be consultation with residents and businesses when the funding becomes available. With the new traffic flow and especially the new stop light, Wharfdale Rd is a disaster. I’m typing this during yet another sleepless night as the buses and heavy trucks idle right outside my window. This can not be mitigated by regulated flow or the SCOOT system because the thing that causes the Wharfdale backup is the traffic light. Pure and simple. It’s a busy street so when the light is red – whether it be rush hour or 2am – the traffic instantly backs up. Instantly. I’ve been out on the corner of Wharfdale and Caledonia Road at 2 and while the streets are completely deserted, Wharfdale Road is always backed up. This will not be fixed by traffic flow since it isn’t traffic flow that causes it, it’s the lights. The only flow solution that would work would be to keep the light always green, which, before they were put in, is what essentially was happening. As I’m sure your surveys have told you, Wharfdale Road is a major bus and heavy vehicles route which is fine if the vehicles are constantly moving – like they were before the recent unnecessary changes – but when a red light is introduced, these heavy vehicles back up immediately, producing tremendous amounts of noise and what I’m sure is an unconscionable amount of CO2. This is a huge mistake here and it needs to be rectified. I know these changes were brought about buy a community lobby group, but I can guarantee that none of these members live on Wharfdale Road and I highly doubt any of them live in the immediate area. If they did they would not have spent 5 years lobbying to fix a problem that wasn’t there. It would seem that the focus of this whole disastrous traffic redirection was the desire to transform part of Caledonia Road from a 3 lane southbound road to a 2 lane south, 1 lane north road. Again, a frankly unfathomable decision which has failed miserably in attaining better traffic flow better flow but has succeeded wonderfully in turning the now north bound lane of Caledonia Road from Caledonia Street to the new Wharfdale Road intersection into a completely unused parking lot. No one uses this section of Caledonia Road. Absolutely no one. You might as well plant trees there as that at least would give this abandoned lane some use as well as mitigate the increased CO2 levels all the idling traffic is causing. I’m not sure what the idea was by reversing the flow of this section of street but whatever it was it was a very misguided one. Calendonia Road has been changed form a busy 3 lane south street into an extremely busy 2 lane south street. The fact that Caledonia road is now even more congested further contributes to the disaster that is now Wharfdale Rd. The redirection of this section of Caledonia Road starts at its intersection with Caledonia Street, the narrow lane bordering Tesco. Again, not sure what the purpose of this change is as Caledonia Street is far too narrow and far too congested with heavy trucks servicing Tesco to be of any use as a decongestion mechanism: it’s intersection with York Way has no traffic light; is far to close to several major bustops; and is far too south for trucks travelling south from the canal to bother using. The intersection of York Way and Wharfdale Road is far better used for this as it has a robust light/turning system and feeds into a wider, faster moving street – or at least it did until the new traffic lights were installed at the Cally Road/Wharfdale Road end. To make matters worse, because of a huge boulevard addition on the south west side of the Caledonia Street/Caledonia Road intersection, turning south on to Caledonia Road is next to impossible. All of this of course completely deters vehicles using Caledonia Street, leaving a now inadequately equipped Wharfdale Road as the only alternative and leaving the new north bound section of Caledonia Road as an empty, unused stretch of asphalt – which, surely, can not be the intention. No amount of signing or SCOOT intervention is going to change this and with the increasingly accelerated growth of King’s Cross the congestion problem on Wharfdale Road is only going to get worse. This is easily fixed by simply returning everything back to the way it was. The recent works at the Euston Rd/Euston Rd/Pentonville Rd intersection in front of King’s Cross, done just over the past few weeks, sets a clear precedent for this type of error correction. After the works, that intersection is now precisely the same as it was 2 years ago before another particularly ill-conceived set of works had narrowed the street and turned that corner into an unnecessary traffic trouble spot. The job of Islington Council is to improve the lives of its residents, something it is failing miserably to do for those of us who are unfortunate enough to live on Wharfdale Rd. I attended the Team Cally meeting on Wednesday, 11th Feb to voice my concerns on behalf of the street and was told in no uncertain terms that this scheme will be pressing on, regardless of the massive decline in our quality of life. Mr. Convery’s best case scenario was an indistinct promise that buses would be the only heavy vehicles eventually allowed on Wharfdale Road; an odd promise of solution considering the buses are the problem. Not sure what to do next be accepting this will not be one of the options. Your guarantee that no one in Wharfsale Rd was in favour of the change to two way working on Caledonian Rd is not actually correct. Other comments indicate otherwise. At the moment I am one of the minority to use Caledoniia St to avoid using Wharfdale Rd, but as this is a quicker way to going up the Cally, as time goes on more will realise the advantages of this route. Better signage would help speed up this process. Bert is quite right, the phasing of the lights needs to adjusted and this will be done. Data on the traffic flows is being collected (which could only be done once the base scheme was implemented) so that this readjustment can be made. Incidentally, the changes at Pentonville/York Way junction are not an example of a previous scheme being “reversed”. There’s a new arrangement of the lanes at the very top of Grays Inn Road to reduce risk to cyclists. TfL did this not to “undo” the previous road width pinching at the bottom of York Way but to enable a clearer path for cyclists heading north. This was in response to the very upsetting death of student Min Joo (“Deep”) Lee in October 2011. In my view this was not the right response by TfL but that’s another longer debate although very relevant to the bigger ambition for changing the whole public realm around KX. Paul: Where did I say the phasing of the light was a problem? The existence of the lights is the problem. It’s this kind of soft-pedal steamrolling that has resulted in 2 months of sleepless nights for the Wharfdale Rd residents. Your somewhat crass inclusion of the unfortunate death into this argument does not merit comment. Suffice it to say the fact that the intersection is basically now as it was originally is self-evident. The fact you concentrated your reply on this minor section of my post rather than correctly represent what I had to say in its majority is, however, extremely telling. Rupert: Do you drive a lorry or bus? Please don’t be swayed by the kind of deflective arguments used by the council here – you are merely the exception that proves the rule. When you were driving up this newly northbound section of Cally Road, was there anyone else in the lane? If you read my original post you’ll understand why the use of this lane will only ever be incidental; no amount of signing will change it. When the lights changed at the junction with Wharfdale road, I saw two cars in Wharfdale road waiting at the lights. Later in the early afternoon I walked along Wharfdale road, and in the surrounding streets, without seeing much traffic. I appreciate that on weekdays the traffic is worse than Sunday. During the week there are occasions when the roads gum up completely, especially with the various bits of roadworks taking place. I guess you weren’t driving by at 2:30am this morning to witness the 4 idling buses outside my window. I live on the street so am in a little better position to gauge the traffic and disruption than someone who drives by occasionally. The fact it was only you and another car going north on the new ineffectual piece of Cally Road does kind of prove my point though. Also, the driver of every black cab I’ve taken home over the past few months have, without fail, commented on the noticeable increase of traffic on Wharfdale. I live on Wharfdale Road and know of at least two other households on Wharfdale that are active in the campaign to get the gyratory removed. We welcome the bold move my Islington Council to push the entrenched TfL and Mayor to remove the gyratory providing at least the possibility of people friendly streets in King’s Cross – ncluding the street I’ve lived in since the late 80s, Wharfdale Road. I guess you don’t need sleep as badly as the over one dozen households now organized to do whatever it takes to get these lights removed do. Sorry, but you are in a vast minority here. Our quality of life has declined sharply since these lights became active and the since the council is clearly not going to provide a facility through which this will change, we’re organising to force them. Please let me know what quadruple glazing, brand of sleeping pills or earplugs you’re using though, I could really benefit from a decent night’s rest. Couple of comments: (1) excellent email from Paul – can anything be done with the Argent s106 monies to relocate the zebra crossing on York Way at Bingfield Street further north so that it is in a more logical place near the steps opposite Randells Road? (2) Sophie talks about the Mayor being “entrenched” – actually I think that in the last eight years, the Mayor and TfL have made good progress in removing gyratories – look at Tottenham Hale and Elephant & Castle? I am astounded that Cllr Convery does not seem to have made the glaringly obvious connection between the absurd no right turn from Goods Way onto York Way, and the unacceptable increase in traffic on the residential Copenhagen Street (which he attributes to the evolving ‘ecology of traffic’?!). If you stop to consider for just one moment the perspective of any traffic coming from Goods Way it is clear that when faced with the impossibility of a right turn towards Wharfale Road (“BUT WHY? !”) vehicles are turning left and then cutting through at the first opportunity (Copenhagen Street). The no right turn must be removed. Having lived in Wharfdale Road for many years, I know that since it was introduced it has always been a huge inconvenience with no sound basis, and of course it is the clear cause of increased traffic in Copenhagen Street… What is your alternative plan Councillor, to reduce traffic in Copenhagen Street? No entry from York Way, thus driving traffic through the even smaller Bingfield Street? Force everybody up as far as Brewery Road before they’re allowed to connect with Cally? What do you think South Cally residents would think about these options? How are we supposed to have visitors, drive to our homes, get deliveries, or get a cab from the station, for crying out loud? I live on Wharfdale Road, it is also residential (well, approx 75% of the street is residential), it is narrower than Copenhagen, and it is full (this morning traffic was backed up to York Way through the lights). I understand the negative impact traffic must have on Copenhagen Street as well, I think the answer is removing the gyratory. Having lived owned a flat in Wharfdale Road since 2003 I can confirm it is a major thoroughfare with major bus routes and no schools, nurseries, or lollipop crossing officers! It is only ‘narrower’ because of traffic calming measures put in since I moved in (the trees, parking bays, cycle lane, and zebra crossing), before which it was a 3 lane nightmare. It is much better for being ‘calmed’, but still needs to allow traffic to pass along it freely without getting snarled up like this – there isn’t a viable alternative route for these vehicles! If I could say to Lorraine, the problems on Copenhagen Street I’m very acutely aware of. That’s why I mentioned it. Sorry to use a florid metaphor about “ecology”. In plain language: traffic patterns in our neighbourhood keep changing as drivers respond to the changing layout of streets elsewhere. We need to reduce traffic on Copenhagen Street, especially HGVs. And I assure you I do see the connection between the prohibited right turn from Goods Way and more traffic on Copenhagen Street. However, I don’t think drivers heading to go north up Cally Road are going to take a right turn and use Wharfdale Road, even if it was permitted, because Copenhagen Street is closer to what the traffic engineers call a “desire line” of travel. Things are getting much worse on Copenhagen Street and there is now an emerging rat-run: Bemerton Street – Bingfield Street – Carnoustie Drive – Caledonian Road for drivers using Copenhagen Street avoiding the junction of Copenhagen Street and Cally Road. The Council is going to restrict that quite soon and is presently doing a vehicle count exercise before publicly proposing a plan. Put simply, there is just too much traffic going through the east-west roads in the middle of a dense residential area. Residents with cars or using cabs and delivery services want access to where they live but over 90% of the vehicle movements on our streets are drivers coming some distance from somewhere else and going somewhere else. So, we should discourage that through traffic whilst perserving access to for residents. So what is your preferred route for the traffic (which isn’t going to just disappear, but will loop endlessly and frustratingly around back streets until you give them a clear route)? Whichever way you want the demonised vehicles to go (resident or not), signage is sorely needed! For the record, I disagree that cars would not turn right then left, Copenhagen Street isn’t a desirable route, it’s not an A road and is narrower on maps. Wharfdale Road is the obvious route when planning a trip, and the way the buses and taxis have always gone. Most people from outside the area would have no idea of Copenhagen Street’s existence, but are now likely to re-route their sat nav when they see Wharfdale Road backed up with traffic. I favour getting rid of the horrific gyratory which oppresses pedestrians and cyclists alike (I do not own a car), however clearly this cannot be done piecemeal like this, and requires a holistic review with proper modelling! I think the viable alternative is to remove the gyratory. As was posted earlier, removing this section piecemeal may not be the best approach.